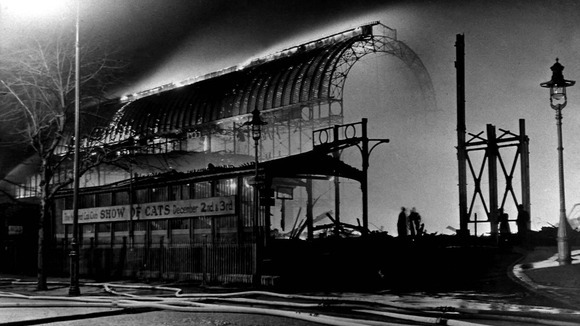 The destruction of the original Crystal Palace, 1936. Although the vast Crystal Palace building was destroyed by fire in 1936, there is still plenty more to discover about the south London park in which it stood. 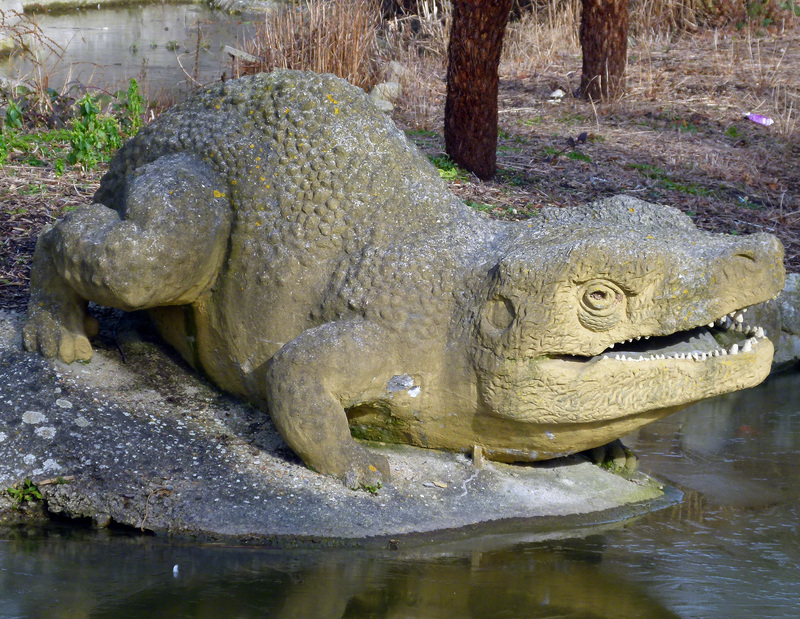 Head to the lake in the park’s south-eastern corner and you’ll find the ‘Dinosaur Park’; the most direct link with the original Crystal Palace pleasure gardens. 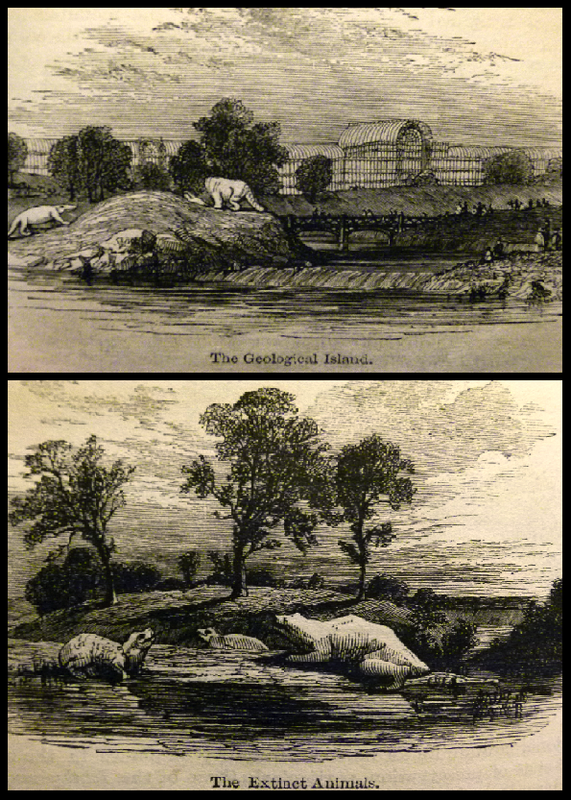 The Dinosaur Park, as depicted in an 1854 guide book. Despite this assertion, today’s palaeontologists generally agree that the Victorian representations are rather inaccurate. However, considering that their original creators- Benjamin Waterhouse and Richard Owen (founder of the Natural History Museum and the scientist who coined the word ‘dinosaur’ in the first place)- were the first to ever attempt such depictions of these long dead creatures, I think it’s fair to say that these faults can be forgiven. 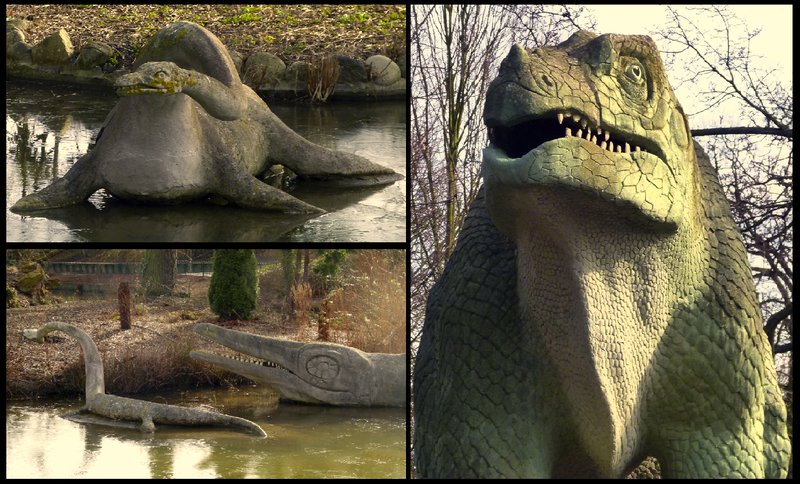 The dinosaur models were very sturdily built; the main materials being brick and iron. They were pricey too, costing over £13,500 (approximately £800,000 in today’s money). 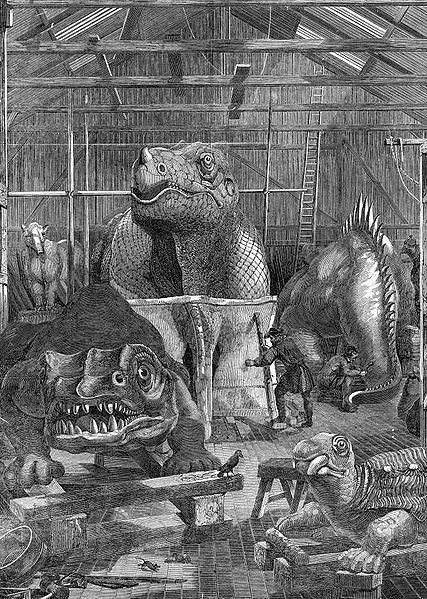 Inside the dino workshop, early 1850s (image: Wikipedia). 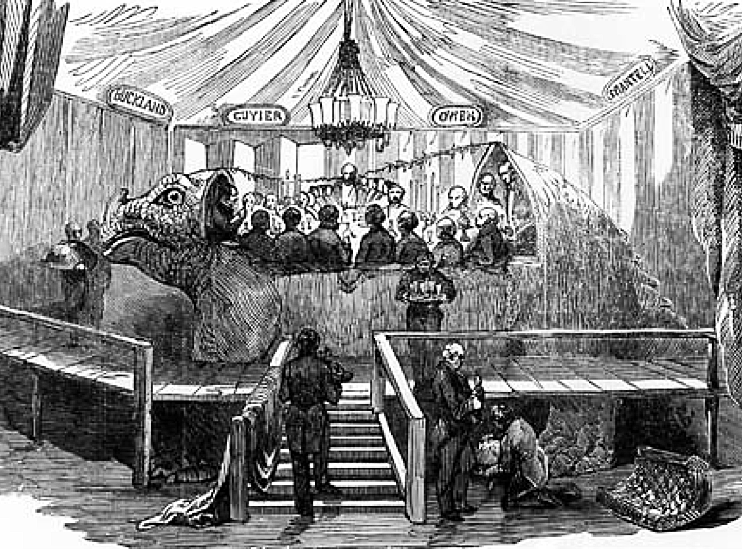 To celebrate their creation, a dinner party was famously hosted inside the Iguanodon model on New Year’s Eve, 1853. So ample was the beast that 20 diners were able to squeeze into his hollow innards. The famous dino dinner, 1853. As the twentieth century wore on the dinosaurs fell into a rather sorry state and by the 1950s they had become entangled with weeds. 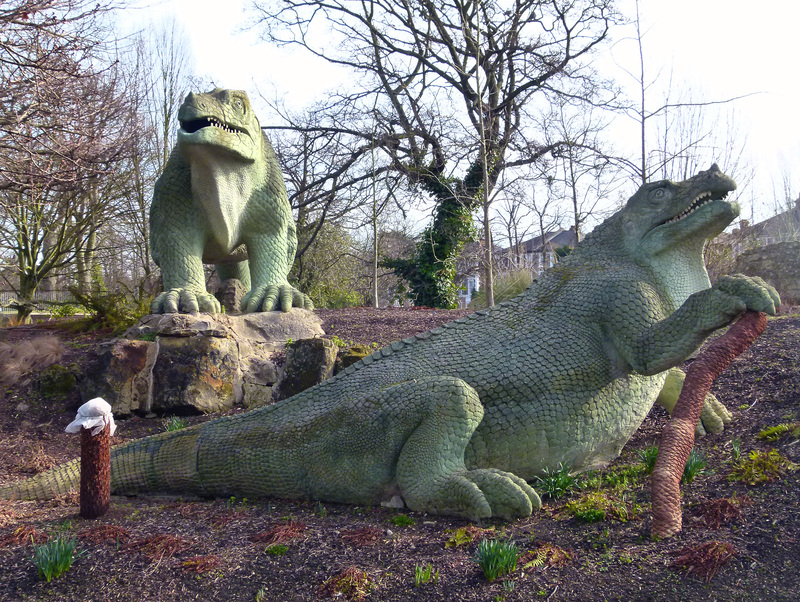 Thankfully, following a £4 million sprucing up and the protection of a Grade 1 listing, they are now in excellent condition, proudly on show for new generations of dinosaur-mad youngsters to enjoy. Another popular outdoor attraction dating from the original gardens is the Crystal Palace maze which first opened in 1870. As with other areas of the park, the maze fell into shameful neglect during the twentieth century, becoming fiercely overgrown and off limits to budding adventurers. In 2008, the maze was saved by the valiant effort of the girl guides, who put their gardening skills to practice, tidying up the leafy labyrinth and making it worthy of exploration once more- it is now one of the largest mazes in the UK. 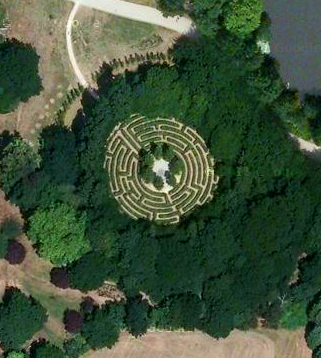 Bird’s eye view of Crystal Palace maze (image: Google). The girl-guides themselves have an important link with Crystal Palace Park- in 1909, upon seeing a Scout rally at the park, a group of girls decided that they should have access to a similar organisation. Sir Robert Bayden Powell agreed to the request and, within one year, 6,000 girls had joined the new movement. In the early 1960s the Crystal Palace Bowl was established in the park’s northern area; a popular, open-air music stage from which artists could perform to up to 22,000 spectators. Classic music and opera were the venue’s staples and in 1971 the first Crystal Palace Garden Party was hosted; a summer festival featuring some of the era’s most celebrated pop acts. The Garden Parties continued until the early 1980s and during their time acts including Pink Floyd, Eric Clapton, Elton John, The Beach Boys, Procol Harum, Steve Harley & Cockney Rebel, Roxy Music, Lou Reed, Deep Purple, Madness, Curtis Mayfield and many more graced the south London venue. In June 1980, legendary reggae musician Bob Marley took to the stage. By this point, Bob was beginning to succumb to cancer and his Crystal Palace gig would be the last time he ever appeared in the capital. He died the following year, aged just 36. 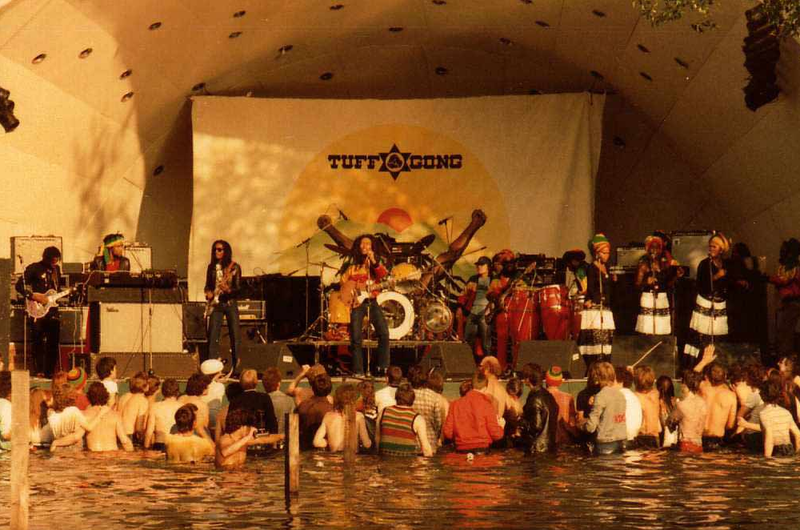 Bob Marley performing at Crystal Palace Park, June 7th 1980 (image copyright Tankfield, via ukrockfestivals.com). 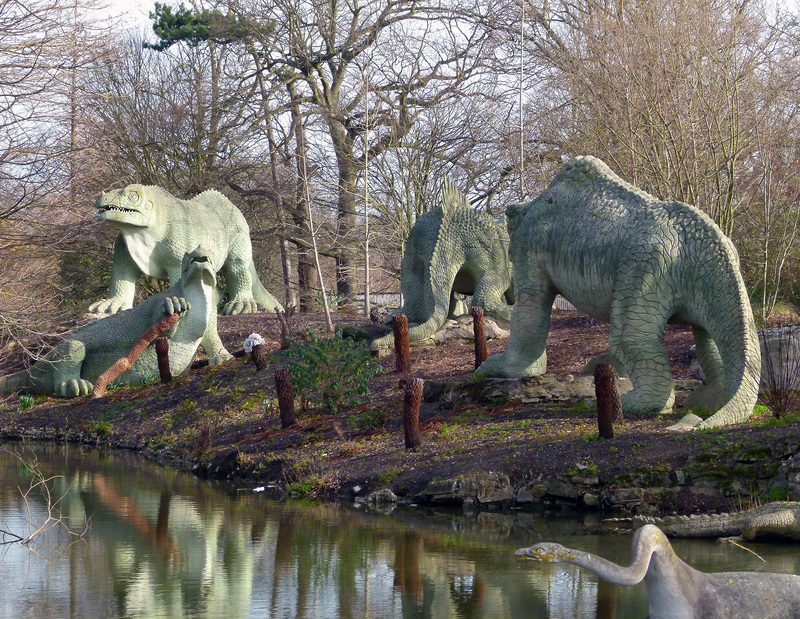 Alongside the gardens, exhibitions, dinosaurs and concerts, Crystal Palace Park has also enjoyed a long association with sport. In 1861, just a few years after the relocation of the glass exhibition hall, a football stadium was erected in the southern end of the park. This became home to Crystal Palace Football Club; an amateur side formed by groundkeepers who had originally worked at the Crystal Palace during its Hyde Park/Great Exhibition days. Crystal Palace Park stadium, 1905 (image: Wikipedia). In 1905, the stadium’s owners decided that the ground was worthy of a professional club, so an entirely new team was formed; although the original name was maintained. In 1915, the new Crystal Palace F.C had to vacate the stadium as it was taken over for war duties. They now of course play at nearby Selhurst Park. 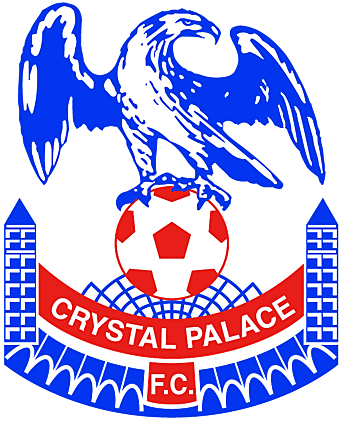 Crystal Palace F.C’s crest- which incorporates symbols alluding to the original Great Exhibition building. As well as being home to the local side, Crystal Palace Park’s stadium also hosted the F.A cup final between 1895 and 1914. 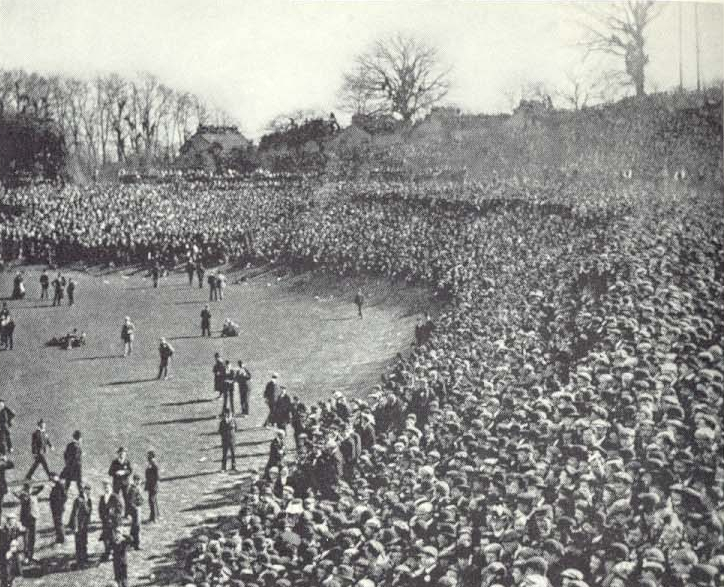 The ground was capable of holding large crowds- the biggest being in 1913 when Aston Villa’s clash with Sunderland pulled in over 120,000 fans. The F.A cup final, 1901 (image: Wikipedia). 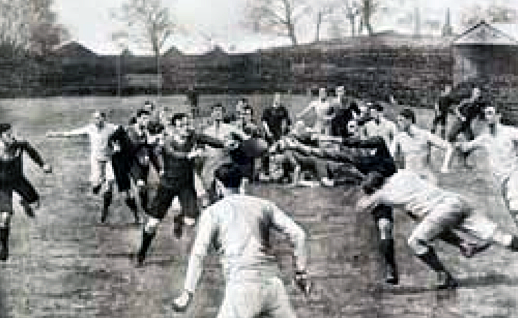 England V New Zealand, 1905 (image: Wikipedia). For a time, cricket could also be enjoyed here with Crystal Palace forming its own team in 1898- masterminded by none other than W.G Grace. 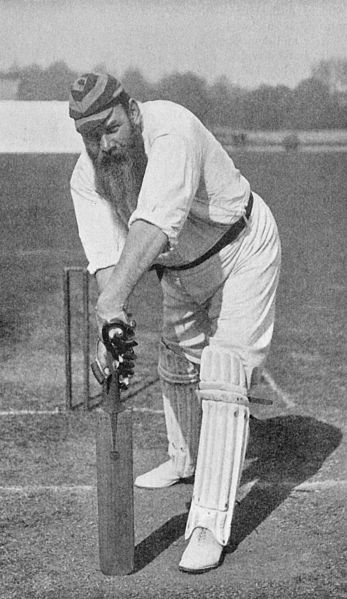 W.G Grace, who tired his very best to get a cricket team up and running for Crystal Palace (image: Wikipedia). Unfortunately, the team struggled to take off and the sound of willow on wood at Crystal Palace Park ceased after just ten years. 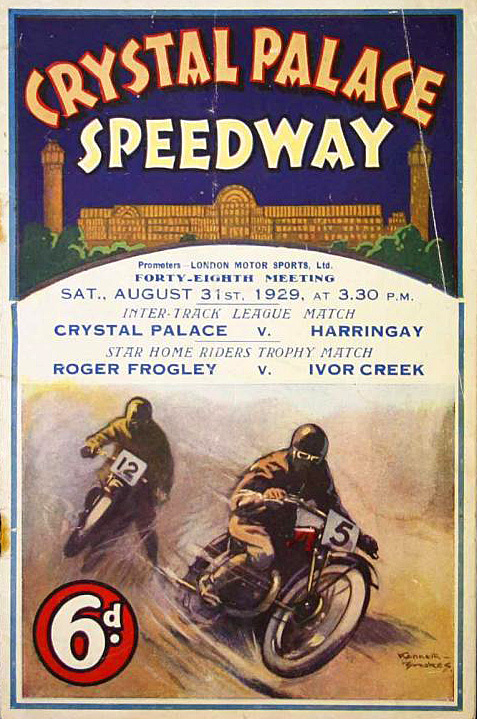 Far more successful was the introduction of Speedway which took over the stadium in 1928. This remained a popular fixture until 1940, when WWII brought the proceedings to an abrupt halt. A 1920s Crystal Palace Speedway program (image: Mullocks auctions). Today, the site is occupied by the modern Crystal Palace Athletics Stadium which opened in 1964 and is capable of seating up to 24,000 people. 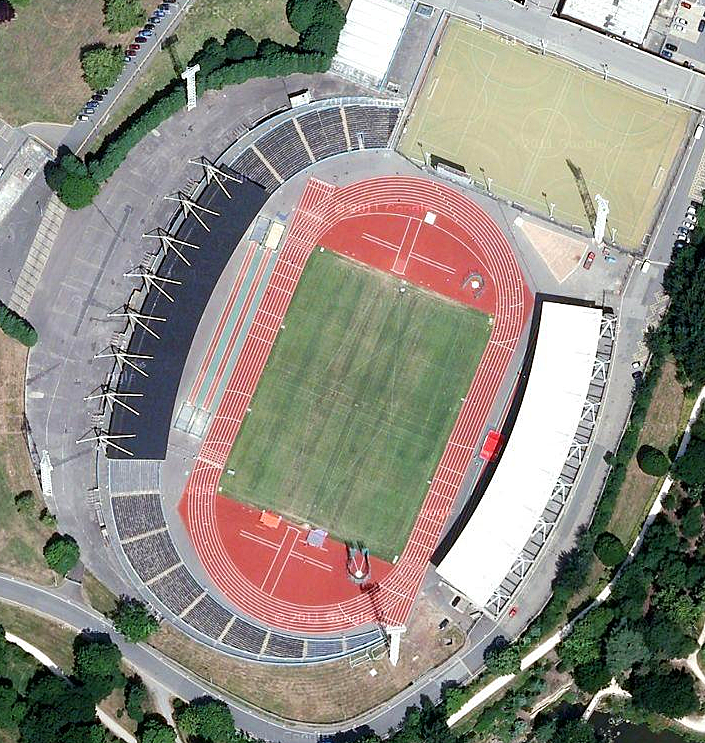 Crystal Palace Athletics Stadium (image: Google). The stadium is accompanied by another 1960s building; the National Sports Centre which provides facilities for both indoor and outdoor sport. 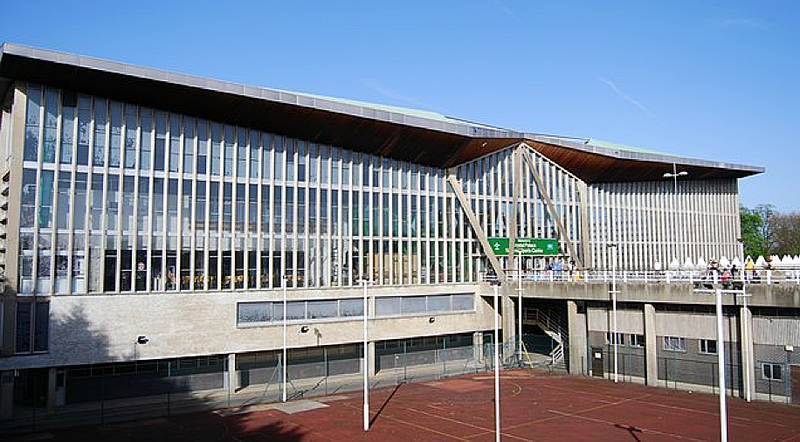 Crystal Palace National Sports Centre (image: Geograph). The Crystal Palace sports complex was first envisioned in the 1950s by Sir Gerald Barry; the man responsible for directing the Festival of Britain. As such, the indoor centre shares a number of architectural similarities with the Southbank’s Royal Festival Hall. Together, the Athletics Stadium and National Sports Centre have proved popular with locals and professional athletes alike and many a British Olympian has trained at Crystal Palace over the decades. Although it may not seem apparent now, Crystal Palace Park was for many years home to a major motor-race track. When it first opened in May 1927 the track was designed for motor bikes. Being one of the earliest examples of such a venue, the circuit was at first fairly basic; made from tightly-packed gravel with tarmac appearing only on the bends. In 1928, whilst flying from Gravesend to Hanworth, a certain Mr R.H Henderson was most grateful for the Crystal Palace track when the craft he was piloting began to experience difficulties. He carried out an emergency landing on the circuit and skidding to a halt less than two yards before a set of iron railings. 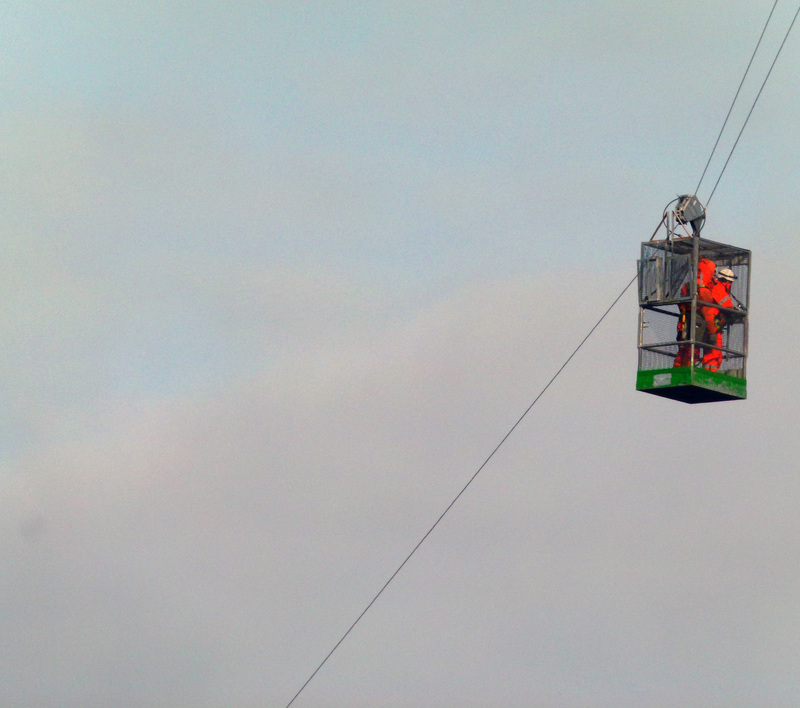 After carrying out repairs, Mr Henderson was then able to use the racetrack to get his plane back into the sky! In July 1936, the first London Grand Prix was staged at the Crystal Palace Circuit. The event was broadcast by the BBC, making the race the first ever example of televised motor racing. In the same year, the track was extended to two miles and made all-tarmac. 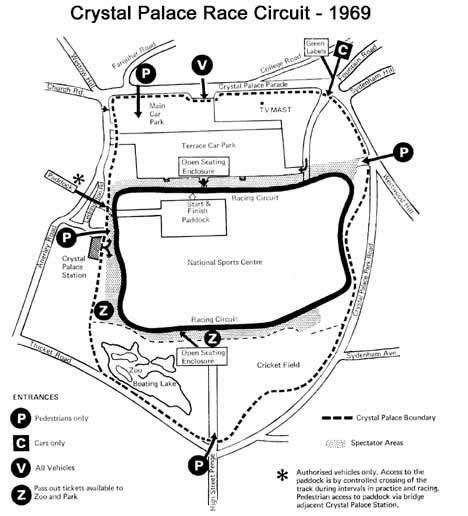 A 1969 map of Crystal Palace race-track. As the power of racing cars increased however it soon became apparent that the Crystal Palace racetrack was no longer suitable for the sport. The last meeting was held in September 1972. Although closed for many years, parts of the track are still clearly visible; much of it having been converted to service roads and footpaths. 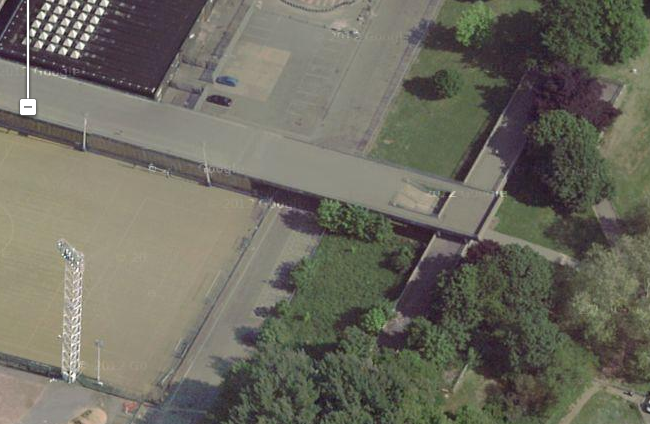 Bridge over the race track’s original start line, located beside the National Sports Centre (image: Google). In 1969, the Crystal Palace racetrack featured in the classic, British comedy, The Italian Job with the audacious crooks testing out their mini-driving skills on the circuit. It was also in the park that the infamous “You’re only supposed to blow the bloody doors off” scene was shot! (Click below to view). Apparently, the film crew over-estimated the amount of explosives required… leading to a spate of windows being shattered nearby! 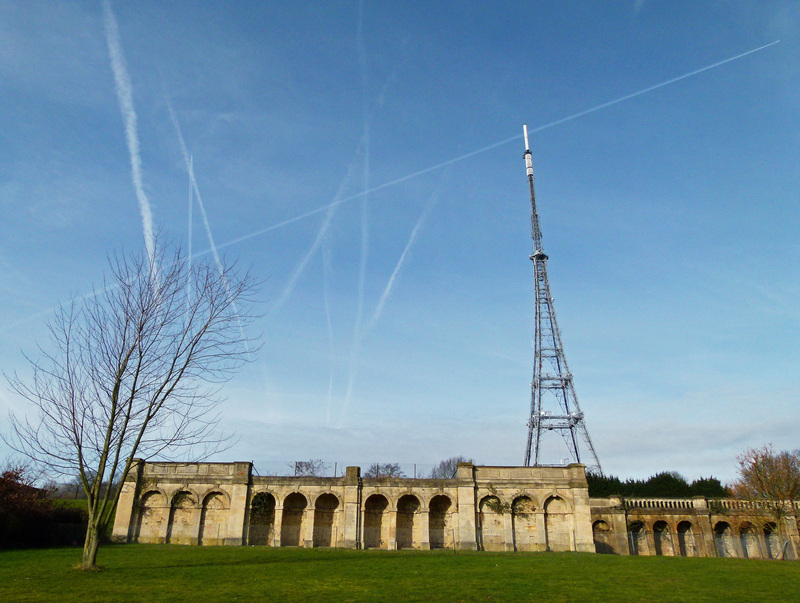 Today, the park’s most prominent feature is the Crystal Palace Transmitter which soars over the western perimeter and has been a well-known London landmark since 1956. The mast stands on the site of the old Crystal Palace’s aquarium with the main control centre sunk underground. 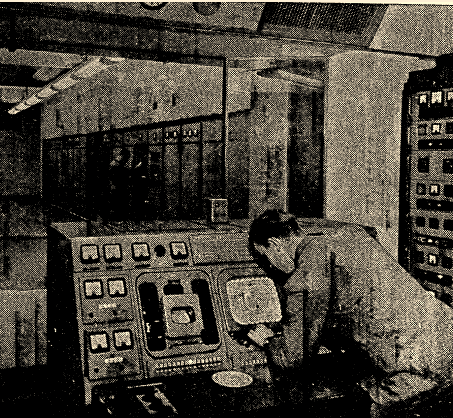 The transmitter’s control bunker, 1957 (image: The Times). 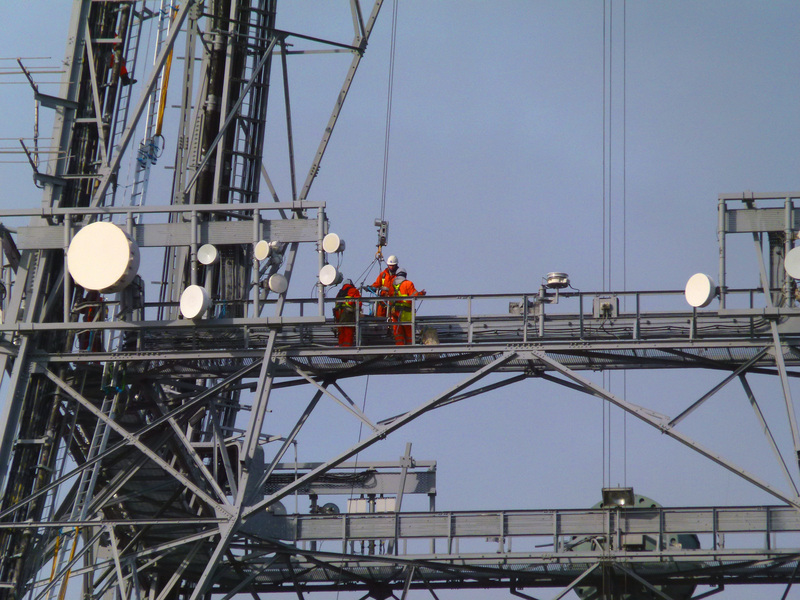 Construction of the tower was a major engineering feat with workers on the project labouring under some pretty precarious conditions. Much of this work was captured in a documentary (shot in experimental colour) called The Phoenix Tower (a reference to the tower rising from the site of the old Crystal Palace which had been consumed by flames). Unsurprisingly, when it was first opened the mast was dubbed ‘London’s Eiffel Tower‘. Despite its elegant appearance, the tower was designed to be rock-solid- its strength being tested in the 1950s by the firing of five rockets which were launched from the tower’s top and exerted a thrust of two and a half tons… the mast didn’t budge an inch. 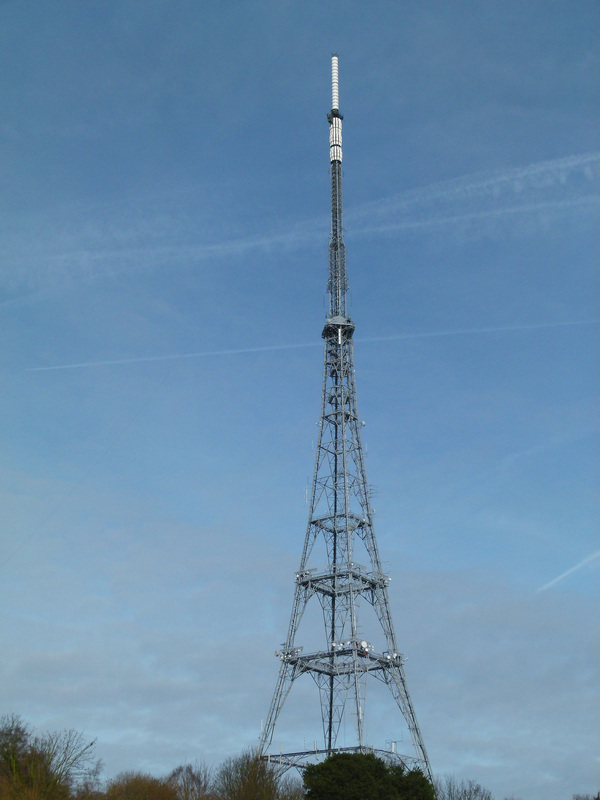 Standing at an impressive 718 ft., the transmitter is visible from many parts of London and is currently responsible for broadcasting television and radio across the capital and surrounding counties; an audience which comprises of approximately 12 million people. 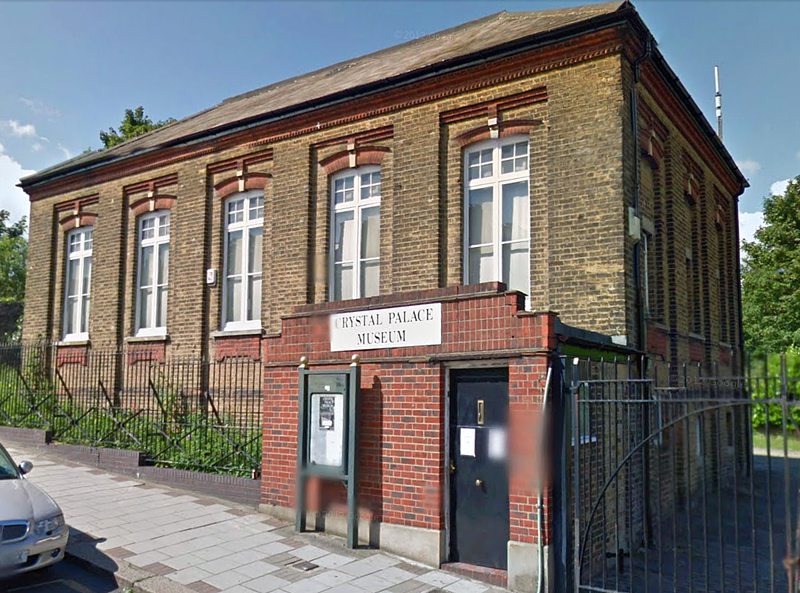 If you’re keen to find out more about the history of Crystal Palace, a small museum dedicated to the original exhibition hall can be found on Anerley Hill, a short walk from Crystal Palace station. Crystal Palace Museum (image: Google). Housed in a late Victorian building, the museum contains a number of original documents and artefacts. For more information, please click here. Dinosaur mural at Crystal Palace Park’s cafe. The picture of Bob Marley in concert. Is it my eyes or are the crowd up to their waist in water? Thanks Damian. You’re quite right, the crowd are up to their waist in water. The stage (which has since been remodeled) has a small body of water in front of it. Looks like things were pretty laid back at Bob’s gig, so the crowd were allowed to wade in! I can remember being taken as a kid to see the fearsome Dinosaurs back in the late 70s or early 80s. The attraction had definately seen better days at this time. Thanks again for the interesting article. Fantastic stuff as always, a reminder that I still need to go have a proper wander around Crystal Palace Park. Thanks, Ian. Hope you get to go there soon. So good! So thorough! I grew up there and found out so much – Many thanks!! Fascinating article! One thing you might not be aware of is the regular road cycling races that occur most tuesday evenings between late april and late august (if the tarmac is dry) . I think these have been running since the 1960s when you’d get fields nearing 300 of London’s finest amateur racers jostling for position. Back then they were allowed to use the entire motor racing circuit around the park’s circumference, but nowadays the racing is restricted to a shorter circuit up by the nw corner and the stage/lake, with rider numbers reduced for elf & safety reasons. Crystal Palace to be rebuilt! I’m looking for what must have been a statue of the “Nymph of Lureilbergh” in the Crystal Palace. It was described by a reporter who saw a picture of it in the diorama of the Crystal Palace in Boston (at Amory Hall, sponsored by P.T. Barnum). There is a poem, apparently inspired by that statue, by Charles G. Halpine (Miles O’ Reilly), in “Lyrics by the Letter H.” published in 1854. The report I’m referring to was published in 1852. Does anybody have an image of this statue? If I discover anything I’ll let you know, Steve. No mention of the worlds fist radio control race track, what a shame. Sorry but there is only so much I can fit in! You’d need a book to cover all aspects of the park’s history. Great article, brings back lots of memories of childhood and I’ve learnt a lot too. I never knew about the concerts or the race track, before my time. I’ve always wondered about the RC race track, whether that was built as a homage to the larger race track that was once there? what was the fire in crystal palace in 1950/60s which we could see from west norwood?